Pangolin introduced a revolutionary lens designed to be placed at the output window of a laser projector to increase the divergence of beams below the horizon, (the area used for scanning), whilst maintaining tight beams overhead. The lens has been a huge success, enabling laser show providers, big and small, to create safer audience scanned effects. Six different strengths of lens are available allowing the divergence of the beams used in the audience scanning effects to be adjusted as required by the environment they are being used. Pangolin have a great type of lens mount to make using the lenses even easier. The new fully adjustable mount can be attached to a projector without need to have fixing holes present, (or drilled!). The mount system uses two adhesive strips, (the same type used in defence and aerospace industries), to create a secure mounting point at the output window of the projector; simply line up the mount with the strips in place, press onto the projector, and the mount has a secure anchoring point. 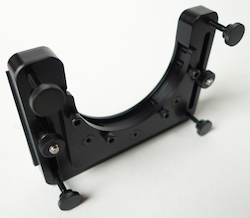 Once fixed, the mount can be adjusted with course and fine adjustment screws, which also offer an additional tilting of the lens. The lens mount can be removed if required for non audience-scanning shows, leaving just the securing points in place. It can then be refitted if needed. For projectors already providing mounting points at an appropriate pitch, the lens can be attached in the traditional way. 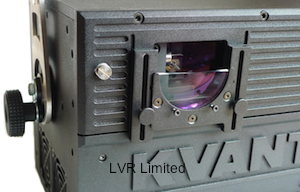 Some projectors such as the Kvant range of lasers, already have a provision to secure an optional lens holder to the device. The image shows a Kvant lens holder in position, securely holding one of the Safety Scan lenses. For projectors that do not have a mounting provision, it should be possible to add a similar mounting point to use either Pangolin's, Kvant’s or a design of your own.